Francisco Mali as Ernani, and Angela Meade as Elvira, in Ernani. BOTTOM LINE: A desirable woman in 16th-century Spain is madly in love with an outlaw despite two other, much more suitable, nobleman suitors. If you had been stripped of your money and your nobility and had suddenly been branded as a rebel with a price on your head, what would you do? Many would probably stay in hiding for as long as they could. Not Ernani. Formerly Don Juan of Aragon, the disgraced Ernani (tenor Francesco Mali) opts instead to gather a small army to claim his lady love Elvira’s (soprano Angela Meade) hand, despite her engagement to her uncle Silva (bass Dmitry Belosselskiy) and the dangers of making himself visible. What makes matters worse is that she has also captured the interest of Don Carlo (tenor Placido Domingo), the king of Spain who is also on his way to becoming emperor. What’s a guy to do to overcome all of these obstacles in the pursuit of love? These abstract challenges lead to subsequent craziness in The Metropolitan Opera’s sumptuously designed and beautifully sung Ernani. Set in Spain in the year 1519, the visuals of Ernani are captivating each time the curtain rises. From the illustrious earth tones that drape the background to the sprawling, majestic staircases, set designer Pier Luigi Samaritani and stage manager Peter McClintock make Ernani a feast for your eyes. Despite Ernani’s dark themes, the opera begins with festivities and merriment. Soldiers and townspeople are happily drinking in an opening scene that fills the impressive stage nearly from end to end with bodies. Unfortunately, Ernani the man is far from joyful. When we first meet him, he sings with tangible grief about his woes. Although Ernani and Elvira are madly in love, she is being forced to marry Silva against her will. With a heartfelt plea, he convinces his men to help him free her. So compelling is his pain and affection for her that we can’t wait to meet the lucky woman who has two suitors vying for her love. When we meet Elvira, she is tucked away in Silva’s castle, dreading the moment that he returns home. Although her ladies-in-waiting envy her upcoming wedding, Elvira is heartbroken over it. She only longs for Ernani. As Elvira, Meade, the only American in the cast, is very impressive both in presence and in voice. 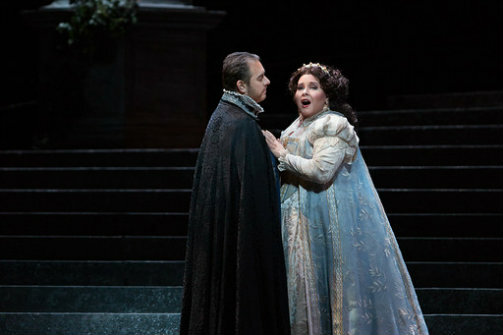 Not the stereotypical waif or typical beauty that one expect (in other genres) to see playing a desirable maiden, Meade’s gifts as a soprano make her formidable, amazing, and seem to clearly substantiate the non-traditional casting. One who fits his role so perfectly, however, is Placido Domingo. Playing Don Carlo for the first time and as a baritone, this legendary tenor is every bit as regal and as commanding as you would expect a king to be. Sadly, poor Elvira is not the least bit swayed by his position when he makes his intentions towards her plain. Soon, the three men are squaring off in a contest to see who gets the girl. While Silva and the king seem to have the upper hand, Elvira’s heart is set on Ernani. Unfortunately, the two wealthy men are much too haughty and much too lovestruck to let Ernani have the last laugh. Though Ernani can be classified as a tragedy because of its ending and its themes, this opera is not as devastating as other operas. This may be partially due to the setting of each act. Set mostly in and around castles, there doesn’t seem to be a lot of suffering going on, even though Mali and Meade do a wonderful job of communicating sorrow. Staging the show mostly in castles also seems to inhibit movement and action. The cast stays around the perimeter of the castle walls and innards without straying too far. Everyone’s station in life seems to be above tragic, particularly since several parties happen during the show. Pain seems to have more gravitas when it’s staged in areas that are more common, more downtrodden. The other reason may be due to Ernani not being rooted in reality. The sheer ridiculousness of the plot seems to dumb down the trouble. Despite these things, Ernani’s brilliant performances and fantastic scenery make this opera a scintillating theatrical experience. If you’re an opera novice, the plot is easy enough to follow and the singing is moving enough for you to get engaged even if you don’t understand Italian. And if you've never been to the Met, don’t worry: subtitles are at your seat and come in multiple languages. And for $25, you can get rush or standing-room-only tickets, making your experience sweeping, transportive and affordable.